Beautiful and rare colonial ranch style single family house on a spacious and tranquil, wooded lot offered in one of Berwyn’s most popular family neighborhoods. Gracious, one level living at its finest beckons with a large, private driveway, oversize two car + garage with generous turn apron. 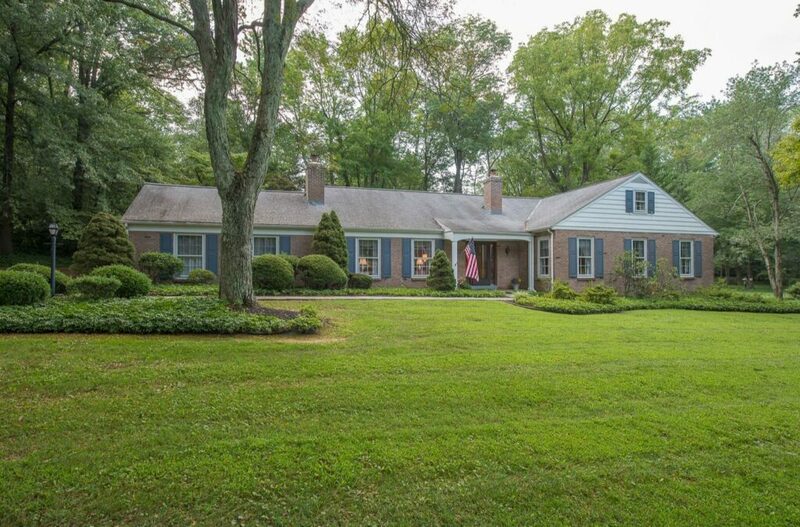 Gently sloping, wooded lot has private brick patio off the family room. Flagstone walkway from drive leads to formal, covered front portico and mahogany front door. Proper center hall with coat closet opens to living room with fireplace and built-ins. Living room opens beautifully to the formal dining room with bay window, all with hardwood floors. Dining room opens back into kitchen, to complete the flow pattern. Four bedrooms, two full bathrooms. Master bedroom has walk-in closet and en suite, full master bathroom with stall shower. Large closets. Family room with vaulted ceiling, skylight and raised hearth fireplace. Family room opens completely to the adjacent, eat-in kitchen with breakfast bar area and ‘office’ work station hutch with built-ins. Partial, unfinished lower level has laundry, basement dewatering system, and mechanicals. Full, floored walk up attic has expansion potential. Perfect for any condo alternative or move-up family buyers in beloved neighborhood, walk-to parks and schools, moments in the car to train and all of Berwyn.